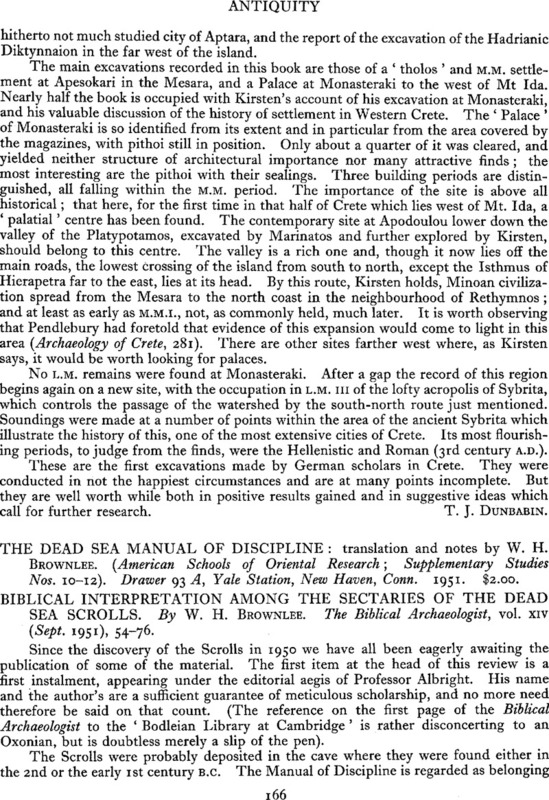 THE DEAD SEA MANUAL OF DISCIPLINE: translation and notes by W. H. Brownlee. (American Schools of Oriental Research; Supplementary Studies Nos. 10–12). Drawer 93 A, Yale Station, New Haven, Conn. 1951. $2.00. - BIBLICAL INTERPRETATION AMONG THE SECTARIES OF THE DEAD SEA SCROLLS. By W. H. Brownlee. NThe Biblical Archaeologist, VOL. XIV. (Sept. 1951), 54–76.